Meyer Schapiro Abroad is an astonishing book. It consists of seemingly commonplace materials--the love letters that a graduate student wrote while traveling to work on his dissertation, plus a selection of sheets from his research notebooks. Yet taken together these pages present something extraordinary and nearly unique: an intensely evocative account of the process and the experience of historical discovery. As almost no other art historian or critic has ever done, Schapiro describes what it is like to deepen one’s imaginative and emotional contact with the past, and to sharpen one’s eye and focus one’s mind on the material and visual culture of mankind. Meyer Schapiro Abroad is the autobiography of a great mind blossoming into maturity. Reading these pages, one can watch as the student transforms himself into the master. Schapiro was twenty-two years old in 1926 when he left America to work on his doctoral dissertation. His thesis advisor at Columbia University had suggested that he study the twelfth-century sculptures of the Romanesque abbey at Moissac in southwest France, one of the first sites of the re-emergence of monumental statuary in Europe after the fall of the Roman Empire half a millennium earlier. Schapiro won a grant from the Carnegie Corporation to fund his trip, but he was not content to confine his travels to France and Spain, as the foundation expected. Over the course of sixteen months he traveled ceaselessly throughout Western Europe and the Middle East, concentrating chiefly on medieval art, but also investigating an astonishing array of other subjects, from prehistoric pottery to modern painting. Only someone of the boundless energy and endless curiosity of Meyer Schapiro would measure mosques in Cairo and photograph ruins in Baalbek as part of the study of an abbey in southern France. The trip was the basis for much of Schapiro’s later work. It provided him with the material for his first major study on modern art, as well as for the influential essays on medieval sculpture he produced over the next twenty years. Two sets of documents help us follow his journey. Eighteen of his research notebooks from the trip are preserved in the archive of Meyer Schapiro papers at the Rare Book and Manuscript Library of Columbia University. Some of the class notes that he made at university also survive, and they are fairly routine stuff--brief outlines of lectures, loose sketches of floor plans and façades, doodled portraits of his classmates and professors; they bear no clear mark of genius. But the drawings and records produced on his trip are distinguished by a completely different order of insight and observation. Over and over again in these journals, he wrote to himself the imperatives “Look” and “Note”--and nearly every page gives abundant evidence of the urgency with which he pursued these commands. A talented artist--he had taken lessons in drawing and painting--Schapiro’s usual way of analyzing a building, sculpture, or manuscript illumination was to draw it. 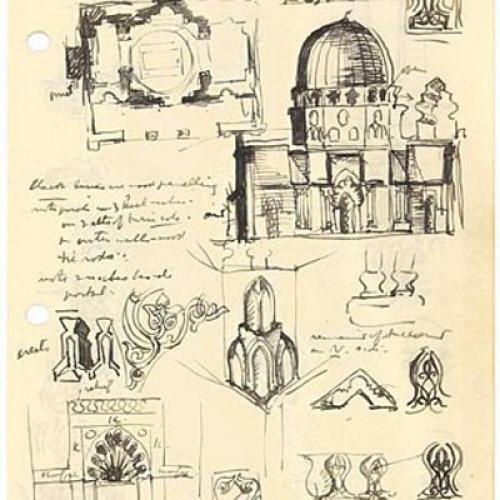 The journals are full of precise and exquisite renderings in pen and ink, which he sometimes also shaded with pale wash. Meyer Schapiro Abroad reproduces, in excellent color illustrations, eighty sheets of sketches from his journals, and it also provides transcriptions of his often cryptic notes on these pages. But it does not explain that these sheets come from different notebooks, and it does not mention that there are hundreds more unpublished drawings in the archive at Columbia. Schapiro’s architectural sketches are especially commanding. He was able to capture the rhythm of a building’s articulation of form and space, the sense of massing and order that it conveyed. Drawn free-hand, without ruler or compass, the structures in his sketches appear majestic and yet full of energy and life. It is common praise to speak of a building as an organic whole, but few have succeeded as well as Schapiro in making an edifice seem like a living being. In his illustrations, structures do not simply stand and bear the load they carry. They thrust upward with surging vitality, like a dancer leaping or a plant unfurling. Schapiro often wrote that he felt like jumping with joy while examining a monument, and the buildings in his drawings seem to mirror this sense of affirmation and delight. Schapiro was interested not only in the plan and the spirit of the works he studied. He also felt an intense concern for their details. With meticulous and loving regard, he investigated seemingly every particular of their articulation and ornament. He was captivated by the complexities of decoration, and sometimes he went bay by bay through a structure, recording its wealth of intricate moldings, figurated capitals, and lacy rinceaux. Surprisingly, Schapiro also measured many sculptures and buildings, often taking multiple readings and noting even the smallest discrepancies in the results. Such behavior might be routine for a team of archaeologists investigating a site, but it is quite exceptional in an art historian or a critic traveling alone. The journals make clear that on this trip Schapiro was teaching himself how to see and how to think, and that he was amassing a vast and personal record of the monuments of the history of European art. Drawing was an act of analysis and memorization. In an unpublished manuscript, probably from the 1930s or 1940s, Schapiro wrote that “the historical study of art requires both the imaginativeness of the panoramic conception and the intimacy and detail of the study of the single object, trait, individual or school.” In the notebooks we see him gaining panoramic knowledge through the attentive scrutiny of one work at a time, all over Europe and the Middle East. The sensitive description, the range of reference, and the intellectual exhilaration that distinguish his celebrated studies--both his works on medieval art, such as The Sculptures of Souillac, and his essays on modern art, such as “The Apples of Cézanne”--were habits of mind that he set out to acquire during his trip in 1926 and 1927. The other records that document Schapiro’s journey are the sixty-six letters that he wrote to his fiancée, Lillian Milgram, a young pediatrician. (They married shortly after his return to New York and lived together until Meyer’s death in 1996. She died two years ago.) These letters, which make up most of the volume, form a perfect complement to the notebooks. Composed during the day, the journals are analytical, fragmentary, and utilitarian--the raw materials of and for intellectual labor. But the letters, written at night, are subjective, meditative, and emotional. In the notebooks, Schapiro discovers the art of the past; in the letters, he describes the joys of discovery. In the letters Schapiro reflects often and at liberty on many topics in the study and the writing of history. But addressing his fiancée rather than a professional colleague, he avoids systematic discussion and routine academic subjects. Instead he seeks chiefly to convey to her the emotional and psychological experience of opening himself up, and of training his mind to understand what his eye is seeing. These are love letters, but of many loves: his love for Lillian, his love for art, his love for history. All these passions rush together in rhapsodic exultation. The immediacy and the intimacy of his account of doing history are the source of much of the letters’ interest. Certainly, these are qualities that separate them both from other reflections on historiography and from the published letters of other art historians. None of the letters of Jacob Burckhardt or Erwin Panofsky are so direct in their descriptions of the study of art or the past. Panofsky and Schapiro later became close friends, and they often wrote each other long and erudite letters about art history--but even in their correspondence neither master was ever as free in thought and expression as Schapiro was when writing to Lillian about his work in Europe and the Middle East. To understand the themes that emerge in Meyer’s letters, it helps to recall the outline of his recent education. Schapiro was the first graduate student ever at Columbia University in art history, which was then a relatively young discipline. There was no set program of study yet, and he was largely free to devise his own curriculum. Exasperated by the lack of imagination and rigor in the art history faculty, Schapiro took classes in an extraordinary range of other subjects, including logic and invertebrate biology, and studied at the Columbia School of Architecture (surely one reason for the exquisite quality of his architectural drawings). But the major influence on Schapiro at university was most likely Franz Boas, the great anthropologist. Boas’s love of primitive art, his desire for a panoramic view of human culture, and his interest in the migrations and transformations of language and mythology were important for Schapiro, as was his belief that academic study should serve progressive and modern ideals. Boas was a charismatic teacher who attracted many rising stars: among his other brilliant students in the mid-’20s were Zora Neale Hurston, Ruth Benedict, and Margaret Mead. (Mead was researching her dissertation, which became Coming of Age in Samoa, at the same time that Schapiro was working on his dissertation in Europe.) Moreover, Boas and his students often did fieldwork in remote places, and in primitive, even dangerous conditions. To accomplish their research required a measure of daring and determination more characteristic of explorers than scholastics. Although Schapiro was bound for Europe, not Samoa or Nunavut, he shared the same spirit of enterprise and adventure. Schapiro writes of his journey as a voyage of exploration, a trip into the unknown. “I have concluded a happy voyage in which I have seen wonders,” he tells Lillian from Paris, “and learned gaily & with passion.” He never mentions the Odyssey by name, but themes found in Homer’s epic make a regular appearance in the letters. Writing of his hope that his brother will share his experience, Schapiro says, “I always encourage him to cross the ocean, to learn languages, to move alone among new people & objects.” These words recall the description of Odysseus at the start of the epic: “He saw the townlands and learned the minds of many distant men.” On another occasion Schapiro declares, “But always the trouble [of travel] yields some interest & not merely interest, but experience that afterwards seems an indispensable destiny, always good to recall.” Destiny, memory, the thirst for experience and knowledge--exactly the themes we find in Odysseus and the Sirens. Like a hero on a quest, Schapiro faced true hardship and peril on his journey. The most direct correspondence with an event in the Odyssey occurred during Schapiro’s trip from Naples to Port Said. Sailing through the Strait of Messina, his boat ran into a storm so ferocious that the passengers could not leave their bunks, and one traveler was killed. The Strait of Messina, as it happens, is traditionally identified as the site where Odysseus encountered Scylla and Charybdis, which made the seas so violent that some of his companions were washed overboard and drowned. The similarities with the Odyssey may be coincidental, of course--but they point to something frequently overlooked about the researching and writing of history. Too many historians think of travel as useful rather than as essential. Study generally is a still, silent, and contemplative activity, carried out in museums, archives, and libraries; and getting to such faraway institutions, or to the sites and settings of the texts that are the subject of study, is often viewed as an unavoidable practical problem rather than as a crucial part of one’s professional and intellectual formation. But not in Schapiro’s case. His letters remind one of the truth of L.P. Hartley’s famous observation that “the past is a foreign country.” Traveling there should be like an act of pilgrimage that sharpens curiosity, and trains the mind, and stimulates the imagination. His Arab friends excited me enormously--for when they learned I was a student, they proceeded to tell me of strange monuments & unknown cities in the desert & beyond the Jebel Druse--I wrote down names & resolved to return to this region: And even more wonderful--I learned that with proper credentials, I could apply to the military commandant at Damascus, & obtain from him a Bedouin, who would guide me, (likewise in Bedouin dress) throughout the farther country. Twenty-five hundred years after Herodotus, Schapiro trekked through many of the same lands, aflame with the same desire. I foresaw nothing of these days. Even the architecture is new, beside the few bare details we had learned at school. To walk in and out of a cathedral, to follow the vaulting from below & to trace its ribs, supports, & buttressing from all sides, to climb the towers & pass thru the triforium openings & galleries & to discover the adjustment of parts everywhere, and the variation from bay to bay, & column to column, & to see the whole in space with such liberty of movement that I seem to learn at each step--it is an awful sentence to finish, dear--but these things quite fill me & I easily lose myself in amazement & then fall into reverie which descends to melancholy historical retrospection & I awaken to a beautiful tolling in the lantern which tells me to draw & take notes. Schapiro often writes Lillian of the importance of reverie in the development of his historical vision and knowledge. When he speaks of dreaming, he is attempting to describe a complex state of mind, with three elements: experiential, emotional, and intellectual. Before his trip, the historical past had been for Schapiro chiefly an imaginary domain, which he could only glimpse dimly through lectures, books, and the handful of remains cast up at the Metropolitan and other American museums. But on his journey in Europe and the Middle East he could physically enter the realm of the past, and know that it was actual and living. The sensory experience of the buildings and monuments he explored--their scale, their physicality, their beauty--was beyond all expectations. And what had been imaginary not only turned out to be real, it also had a heightened intensity and a supercharged presence far unlike anything he had experienced before: it was dreamlike in its beauty and its force. Schapiro uses the word “dream” in his letters also to characterize his response to this encounter, to describe both the wonder he felt and the unleashing of his mind to think freely about what he was observing. I walked late this afternoon to the cathedral, which is beautiful, & took me from this vexatious business--I think the earlier preoccupations were good, since they left me in a mood in which the architecture was wonderfully relaxing or quieting--There was no desire to know--or to study; & every detail had some charm for me: & I noticed what usually escapes me. The air of the interior, the quality of the space, the darkness & half-shadow, the scale of the few others in the building, beside the rising shafts. ... There was a happy collusion of my mood (reduced to innocence by fatigue & the thoughts of the past few days) with the objects about me. I was practically alone with them. The statues & pictures & capitals & windows were in an immense space, limited & undefinable--all mine, in shadow & light ... I thought that nothing could be happier than to give oneself completely to these objects, to study them minutely, know every detail--living whole years with them--There would be no method--no school of thought--no simple approach which criticized the others--Besides the perfection of craftsmanship & thought, the peculiarities of individual minds--the possible moods in which a man 300 years ago made the Virgin look proudly at the angel Gabriel--as an amply gowned Roman matron; & another 400 years earlier, attenuated all figures & gave them sorrowful staccato gestures--& another, a little before, carved Adam, Eve, Christ, Lazarus, Moses, angels, devils, as fat goitrous smiling people--these moods too must be recreated, to prolong the day dream that accompanies love of the work.... I wished also to carve & paint ... And I wish also a hundred thousand other things--all because of this voyage. I know I shall soon be with you, darling. My mind feels differently & thinks in other ways about matters that had occupied me long before; but it has happened unconsciously, as if I have acquired a new craft--And it is a craft--for the great part of the journey’s experience was in learning by touching, seeing & moving about objects--school now seems strangely passive or another habit with other ends. I love architecture all the more. May we make this same journey many times together, sweetheart. The conviction that art history and criticism were often tendentious and too abstract remained with Schapiro throughout his career. As a writer, scholar, and teacher he sought to avoid pre-conceived schemata of interpretation, and instead to concentrate on the actual experience of looking at the work of art. On the train, I was in great joy--to be going once more ... Small stretches of the trip excited me as bits of El Greco & Titian this morning in the Prado--I think of the evening coolness, and the one cloud, the still faint crescent moon over a world that was all below me, receding in one place, alternately fertile & populous and arid desert--were the very opposite of Madrid, where I only saw tall houses and an endless stream of people in cafés & shops & narrow streets & driven by the heat--But when I entered Segovia I rode into the town square--which was again a small Madrid; a band play--; under the arcades and out into the square cafés and seated crowds; and children dancing & as much animation as in a city ten times the size of this--Here I was delighted: I had no sooner found a room than I ran down to the square & walked about, finally sat down, & drank coffee till midnight (Hooray! I have found some ink!) ... The Mozarab church of S. Cristo de la Luz kept me several hours--for it has a great variety of construction: & a most beautiful south wall. From the photos I had judged it a large building--It is tiny. The exterior arcades are proportioned to effect an endless movement & variety. One half of the building is pure Arab--the other mixed, Roman, and Byzantine & Persian--I wandered around the walls of Toledo, thru the old gates--which are a great thrill to me, & show that the Moors could also mass, & work finely with voluminous towers and walls. In one church I jumped to see apsidal fenestration identical with that of the Pantokrator in Constantinople--the street was no different from the oriental-- ... Later, near the Alcantara bridge was another view equally exciting--without warning, mountains rose from a plain: the river turned twice; & on high rocks--gloomy & jagged, stood the city--El Greco painted this--his finest landscape--I [went] to his house, once the home of Simon Levi--furnished with Moorish & Christian fittings--Next to it in the Greco Museum were 20 of his pictures--but not the very best ... The best of El Greco is in the Prado, beside Titian & Rubens--I thought to cry out with joy at some pieces--You should have been there: & I would have kissed you wildly instead: & my meaning would have been clear--I did not know what to look at--or why to stand & gaze--what to think.... It is two AM. All the church bells of Segovia are now playing. This is a form of ecstasy. In its excited celebration of movement, art, and experience, the letter is almost like something by one of the Beats; and it is worth remembering that later, as a professor at Columbia, Schapiro taught and encouraged many writers and artists of Dionysian temperament, including Allen Ginsberg, Jack Kerouac, and Allan Kaprow. By allowing us to watch him at work, Meyer Schapiro Abroad helps to reveal some of the motivating principles at the heart of Schapiro’s own scholarship. He believed that art historians and critics should strive to exemplify three ideals: “objective attitude,” “responding sensibility,” and “immense receptivity.” I have drawn these phrases from his study “On the Aesthetic Attitude in Romanesque Art,” from 1947, where he uses them to describe the ideals of some medieval writers he admired; and I will use some of his language in that essay to show what he intended by these terms and how they can be applied to his own work. For Schapiro, “objective attitude” meant an “exactness in describing” a work of art. He sought to apply this standard both to an accounting of its physical attributes as well as to the judgment of its aesthetic characteristics. It denoted the desire for completeness and accuracy in measurement--how big a work is, how many parts it is made of, and similar questions; but it also pertained to questions of a higher order of analysis and interpretation, to “the effort to read the forms and colors and to weight their effects.” The aspiration for truth is not merely an intellectual principle, it is also a moral one; and for Schapiro it was the supreme obligation of any historian. It is noteworthy how often throughout his career Schapiro was stirred to publish critiques of critics, philosophers, and historians--Berenson, Freud, Heidegger--when in his view they failed in this duty, especially when he believed that vanity, arrogance, or selfdealing contributed to the failure. Yet Schapiro did not think that objective description and accurate analysis alone were sufficient for the history and the criticism of art. Art is made to create an experience, and if one ignores its experiential nature--its lived power--one is denying or distorting its essence. Hence he believed that it was necessary for the historian to bear a “responding sensibility,” and to “convey the spectator’s excitement and fascination as an experience of its own kind, sometimes so intense as to recall descriptions of religious ecstasy.” The critic or historian should seek to understand and call attention to what was striking, moving, or inspiring in a work of art. Schapiro was an unembarrassed--more, a principled--enthusiast, and he wanted others to share in the joy of insight that he felt when studying a picture, a sculpture, or a building. By “immense receptivity,” he meant “curiosity about” and “readiness to admire” the art of new or foreign cultures, beyond native traditions and inherited expectations. Throughout his career, Schapiro shied away from the study of art that was generally regarded as classical, naturalistic, or normative. The only periods in the history of Western art he almost never wrote about were Greco-Roman antiquity and Renaissance Europe. Instead he was attracted to periods and styles that could be celebrated as new eruptions of energy, whether in the archaic, medieval, or modern eras. Schapiro distrusted any effort to reduce cultural or intellectual activity to the reception of established opinions and settled practices. In aesthetics, likewise, he believed it was only by continual exposure to little-known, exotic, and primitive styles, and by a real effort to understand the motives behind such unfamiliar modes of creation, that one could challenge and refresh one’s own assumptions. And even then we might fail to do justice to the art of other times and cultures. He worried that “our immense liberality toward the most varied styles, and our eagerness to enlarge the aesthetic horizon, do not exclude a certain narrowness and arrogant partisanship in taste.” He sought to achieve a panoramic vision of human achievement; and although he recognized that it was optimistic or even naïve to do so, he hoped that the visual arts could serve as a vehicle of mutual understanding for people around the world. Before taking up art history, Schapiro had considered becoming a painter, an architect, or an anthropologist; and his training as an artist and an ethnographer gave him a perception of culture different from the typical view of most academics. The writing of cultural history is often characterized by a desire for stability and order. It tends to be retrospective, to look back to a Golden Age and an ideal setting, such as Raphael’s Rome or Manet’s Paris. The nostalgia in this point of regard is increased by the monastic traditions of the professoriate. Many historians spend their entire working lives within the protective walls of the academic cloister; and like medieval scribes, they see their work as primarily dedicated to the preservation of special monuments and sacred texts. Culture, for them, is made up of forms to be saved, copied, and imitated. But there is another approach to cultural history, one that acknowledges that it is ceaselessly dynamic and endlessly changeful. This view emphasizes the migration of peoples, the exchange of goods, the transformation of traditions and symbols. It draws on the experience of the traveler in the world, rather than on that of the priest in the sanctuary. It looks outward and over the horizon, rather than only inward and back; it thinks in terms of the map rather than the holy book and the sacred totem. In this understanding, history is made up of a multi-nodal network in which there is a constant, unstoppable flow of energy--persons and things and ideas and images and practices; and the weight and the importance of the many nodes is always shifting. There is no Golden Age, no Caput Mundi, because there are so many. Schapiro exemplified this second approach. Before he became a historian, he worked with Boas, who taught that “all cultural forms appear in a constant state of flux.” Human culture has no one center, no single ideal manifestation; it never has and it never will. All is variation and movement; and each part must be studied in relation to the others. This synoptic and comparative view is very different from the Hegelian linearity that underlies so much of the writing of cultural history. Boas lectured about these differences and believed that historians should learn from the anthropological standpoint. Both at the time of his dissertation and later in his career, Schapiro traveled widely to acquire a map in his head of the culture of the world, and he remained fascinated by the mutation of styles and symbols and iconographies across large expanses of time and space. He grasped connections between places and cultures that others viewed as disparate: Baalbek and Moissac, Constantinople and Toledo. Unlike most art historians who work only on one place and one time, Schapiro worked on many and believed that art history should seek to understand “the whole of known history in panoramic extension and relatedness.” He did not admire the cloistered sacredness of medieval art, as others did; he argued instead that Romanesque sculpture was a form of discourse with the world at large. Similarly, he believed that academic study and teaching should thrive in its contribution to public discussion. Schapiro stressed that the experience of modern artists helped us to achieve a new understanding of culture, one in which “the accomplishment of the past ceases to be a closed tradition of noble content or absolute perfection.” Instead it is “a model of individuality, of history-making effort through continual self-transformation.” The effort, creativity, and independence of earlier genius, not the external forms of its products, are what we should emulate. Schapiro was the most celebrated teacher of art history of his generation in America. Yet the example that he provides is perhaps even more urgent today. In art history now, “objective attitude” and “responding sensibility” are typically viewed as contradictions. Historians of empiricist inclination tend to look with severe distrust at the subjective components of aesthetic judgment, while those drawn more to interpretation often slip into the solipsisms of high theory. The results of this conflict are paralysis and sterility. Moreover, for all the talk of interdisciplinarity and multiculturalism, the profession is increasingly narrow-minded and presentist in attitude. Whole continents and many millennia are routinely overlooked. There are extremely few academic or museum positions in Indian, African, pre-Columbian, ancient Near Eastern, Southeast Asian, Oceanic, or pre-historic art, and even those for classical, medieval, and Renaissance art are in sharp decline; but every institution seems to have someone working on the status-conferring art of the last fifty years in America and Europe. The “arrogant partisanship of taste” and “the general and verbal manner” and “assigned routines” of scholarship that troubled Schapiro long ago are even more prevalent in art history now. Anyone today seeking to imagine afresh the possibilities of the discipline, and to give it new energy, would do well to look to the example of his universal range and his rigorous joy. Andrew Butterfield is the President of Andrew Butterfield Fine Arts, LLC.